As we enter the season of Advent, my own life is filled with sunshine and shadows. The birth of my first grandchild filled me with great joy but it was preceded by the tragic loss of a dear friend of 45 years. The husband of my best friend and father of her 12 year old daughter, both killed in a tragic car accident in 1997, now followed by loss of this dear man who lost his own life with one simple misstep while hiking. A wonderful family that sold us part of the land we still live on. A family that shared our lives as we each built our own homes, and each raised three children as each as each others best friends for the next 20 plus years. A loss that now leaves the two surrounding sons without parents, without grandparents for their young children from their sides of the family, and our family with a loss that will never end. This terrible loss of this friend on top of the loss of the others, was the sad but perfect example of how life can turn on a dime and it is completely up to each of us to change our own circumstances, our own view of life and of living and why bad things happen to such good people. For me, life is all about the journey, and the lessons that I have learned as I have traveled along its path. For that is how I live my own life, dealing with crisis, loss, and tragedies, while creating a vision of a new world and new feelings that I may next journey into. For all we all live a series of lives, one upon top of the other...over and over. There may be new players, or new memories, or new lessons learned. But it is all of the myriad of pieces..the bits and the fragments, the remnants, and the gifts..all quilted together that create our own world and how we choose to live and walk with in it. For now, I choose to create once again and so, I made an 'Advent Wreath' to bring light into the sad and darker parts of my own emotions so as to usher them back into the light once again. An Advent Wreath and the lighting of its candles has been around long before the Middle Ages. As most of our spiritual, or religious holi-days, it is a way of transforming the new (and almost always predating Christianity) into our own personal spiritual practice. Using leftover pieces from our permanent (i.e. 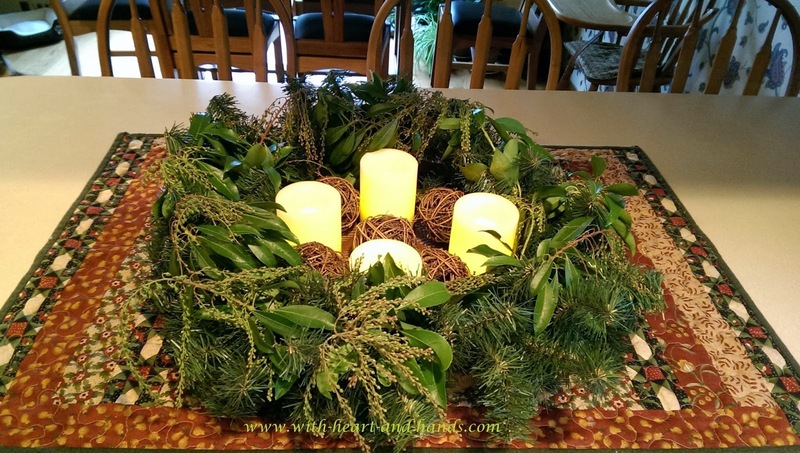 not 'real') holiday garlands and swags that adorn the loft and stair railings of our home, I created a simple circle shape on top of a flat gathering basket. From my gathering outsides and all of the bits and pieces of bushes, shrubs and trees, I added those to my inner wreath, almost complete disguising the non-real from the real. A way, in my own belief systems of merging that which is seen with that which is not. Adding four of the traditional candles, in my case off-white, whereas your traditional might be white, or the roses and purples of other traditions. Once lit, the light casts out the dark, while still reminding that shadows are nothing more than that which the light has cast through the Buddhist 'maya' of illusion and into our clarity of understanding. I welcome the light of acceptance and understanding, while still remembering all that has been and still is in another dimension of reality. May your own life be lit up from within as you create the light in your own life. I love the idea of casting light but leaving the reminders of shadows. Beautifully said and created. I am so sorry for your loss. Lovely. Celebrating the lives of those you have lost by lighting the candles--so you, Michelle. Advent blessings to you Michele, your wreath looks beautiful . These lovely creations encourage our inner lights if and when the shadows fall.